Lantern Shape Home Address Plaque - - lantern silhouette shape sign personalized with your house number or a short name. The traditional lantern shape is suitable for contemporary and traditional homes. Made in USA. 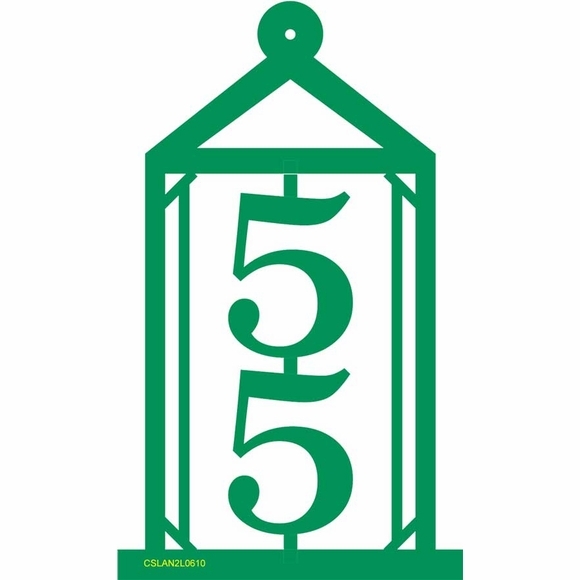 Wall mount lantern silhouette sign features floating numbers. Therefore, the wall behind the lantern shape plaque is the background color. You'll want to pick a color that is suitable for your wall. small: holds two (2) 3" characters; 6.25"W x 10.5"H x 1/8". medium: holds three (3) 3" characters; 6.25"W x 14"H x 1/8". large holds four (4) 3" characters; 6.25"W x 17.5"H x 1/8". Please be sure to use the correct input box for your address. Leave the other two boxes empty. Withstands temperatures to 175-degrees F without deflection. Colors: black, burgundy, ivory, white, grey, charcoal, red, yellow, green, blue, brown. Comes with 3/16" diameter fastener holes and stainless steel mounting screws. Lantern not big enough to hold all the characters in your address or name? No problem. We may be able to supply this sign to meet your requirements. Please contact customer service with your specifications for a quotation (customerservice@comforthouse.com).